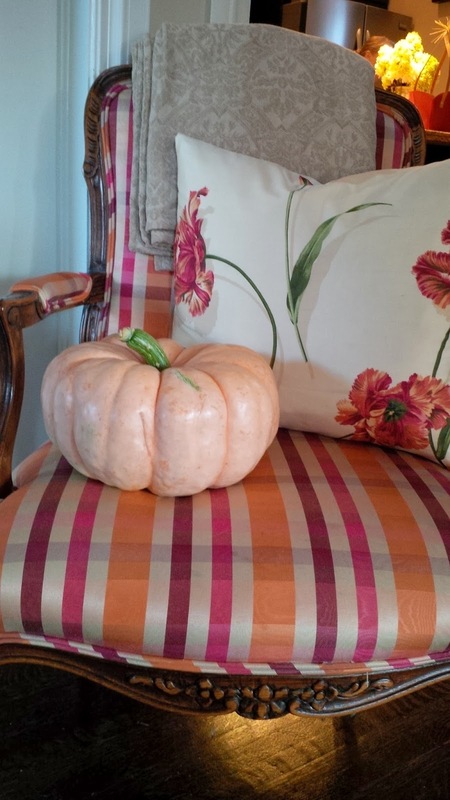 Laurie Loves...: Pumpkins - Designer Style! Nothing says fall more than a bright orange pumpkin! Inside or out, their bright, and on trend (! ), colour is perfect for seasonal decorating. More on that in an upcoming post. But, if you are searching for a more sophisticated and 'designer' look for fall, take a peek at some of the more interesting hues these Halloween favourites come in. I love white ( ghost ) pumpkins too! This silvery blue grey is also lovely. But while out at the grocery store on the weekend with my friend who is an interior designer, we came across a bin of oh-so-pretty PINK pumpkins! Neither of us had seen these before and we instantly fell in love with them. I later discovered they are called 'Porcelain Doll Pumpkins". We spent quite a while digging through the bin to find the pinkest one in the perfect shape to take home. It looks amazing sitting on my friend's gorgeous silk covered chair in her entry way. So when you are looking for a pumpkin this year, move away from ordinary orange. Pick a new colour and get inspired!